File Exchange Support for PSD, OBJ, Etc. 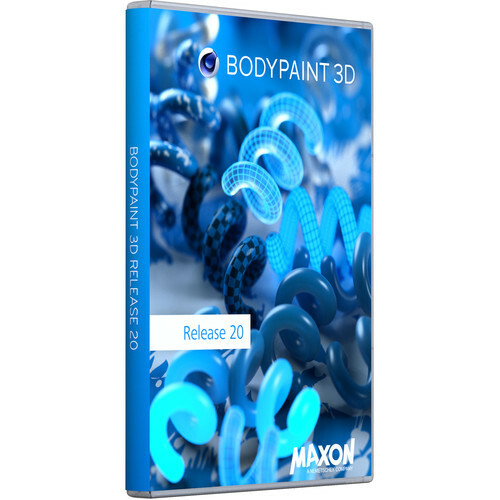 Maxon BodyPaint 3D R20 offers a full 3D painting workflow for texture artists to create detailed textures for film, games, and other applications. BodyPaint 3D lets you create rich, highly accurate textures by allowing smooth painting of textures up to 64K and 32-bit. Support for .PSD files allows you to paint textures in both BodyPaint and Adobe Photoshop. Specific views can be exported to Photoshop and reprojected back onto the 3D model in BodyPaint 3D. You can even load your favorite Photoshop brushes into BodyPaint. BodyPaint also connects well with 3ds Max, Maya, Softimage, and Lightwave. Other applications can exchange files with BodyPaint 3D using one of the numerous available file formats (e.g. OBJ, FBX, or COLLADA). BodyPaint also provides an advanced interface that lets you control how pressure, tilt, direction, rotation and barrel roll affect any brush attribute. The application is compatible with Mac and Windows systems. Note: This Competitive Discount provides the perpetual version of BodyPaint R20 at a discount to government and non-profit organizations, owners of any Cinema 4D software in any version and release, and owners of any other 3D applications.